The Rimfire Challenge Shooting Association (RCSA) Rimfire Challenge is a .22LR rifle and pistol program created to introduce new people to the shooting sports and provide a pathway to shooting competition. Quality matches allow both new and experienced shooters to excel at the fun sport of shooting steel targets using .22LR pistol and rifles. If you’d like to get started in shooting competition, have fun with your family or just want to get more comfortable shooting a pistol and rifle, the Rimfire Challenge is perfect for you. Our experienced shooters are very willing to help new shooters out no matter what your experience level. See below in the More Info section on match details. Don’t let equipment keep you from coming out – we have loaner pistols and rifles just send an email to the match POC. We are happy to get someone started in the sport we love. It's clear that while I may be out of practice over the winter some of our shooters are not! Some great performances today! The weather could have been worse - we had light sprinkles periodically and a more steady rain for about a stage but overall I'll take it over 90+ deg weather in August. I'll start with the young 'ens since they really stole the show on the one second challenge. If you look at the stage breakdowns you will see that the youth really do have the quickest reflexes. Jay S took that stage but Quinn F had the fastest string of 1.04 sec. Jay was also top Youth (open) with 69.16 sec and second place in Limited (110.08 sec) with Jay in second place Youth (open) with 79.56 sec. In the Junior category Gunnar F (Limited) took the top spot edging out Jordan B (Open) with a 101.65 sec to Jordan's 103.24 Sec. Both are excellent times! Continuing the Top honors. Top Lady and third place Limited goes to Jen D with a fast time of 97.29 sec. Top Senior and second place Open went to Scott S burning up the range at 60.05 sec. Overall match winner was Dillion S (open) - shooting for a total of less than a minute today - with a score of 52.03 sec. Second place open was Scott S as mentioned above and third place goes to Steve G very close behind with a 61.68 sec. Limited top place goes to Joe M, out in the lead with 73.03 sec, while Quinn F came in second with 84.14 sec followed by Jen D at 97.29 sec. First place in Manually Operated Harry B was right up there with the limited and open shooters at 83.20 and second place was Carson F at 126.54 sec. Thanks to everyone who came out and helped set up and all the safety officers who work extra hard to ensure we are all safe and allow this match to happen. We are always looking for more folks to join the ranks of rimfire safety officer. Talk to me if you are interested. The more safety officers we have no only the more squads we can run but it makes it easier too! See you next month - last Sunday in April the 28th. 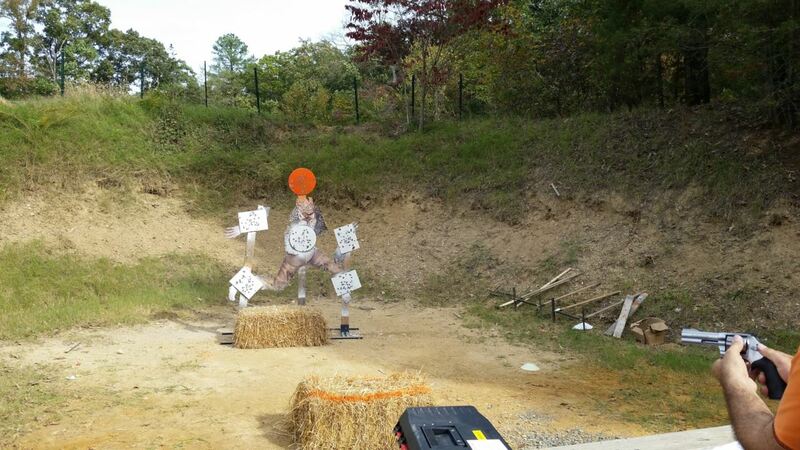 Shoot 5-7 steel plates in the order described as fast as possible with pistol (7-10 yds) and rifle (10-15 yds). More details are in Course of Fire below. OPEN TO THE PUBLIC – all ages, under 18 with an adult. ALL skill levels from Novices* to experienced shooters. *Novices - First time shooting Rimfire Challenge. Check out our Novice Info which will hopefully answer all your questions but if not, feel free to contact the match directors with any questions. Youth/Juniors, Novices, Wounded Warriors and Paralympians FREE. *Note: Not technically Divisions per RCSA rules but Cowboy/Girl is a Special Recognition Category and our club recognizes Manually Operated as long as the requirement for 3 participants is met. .22LR pistol: Semi-auto or revolver with 5 magazines or speedloaders. .22LR rifle: Semi-auto, lever, or pump with 5 magazines or tube loader. Magazines: For match efficiency please try to have 5 loaded magazines or speedloaders for each firearm prior to starting the stage. If you don’t have 5 contact match director to see if they can loan you more or let squad safety officer know and someone will reload for you when you are up. Ammo: up to 11 rounds per string or approximately 400 rounds max. 6 stages - 3 pistol and 3 rifle stages. 5 strings are shot on each stage, each timed separately and reloads are NOT on the clock. Best 4 strings count. Start position is pointing firearm at cone on the ground about halfway between table and steel. Sight picture with an unloaded firearm is permitted but finger must remain off the trigger while taking a sight picture. While stationary, shoot the steel plates in the order as described by the stage description with the last shot on the Stop Plate. Maximum of 11 shots per string. Stage 1 - "No Bones About It" - Shoot the plates in any order but the skull plates were 'no shoots'. If you hit a skull plate it was a 2 sec penalty! 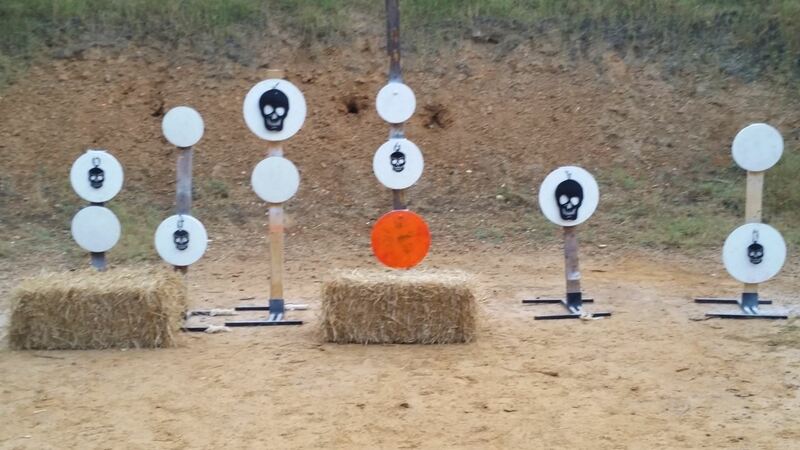 Stage 2 - "The Walking Dead" - Shoot the plates in any order. 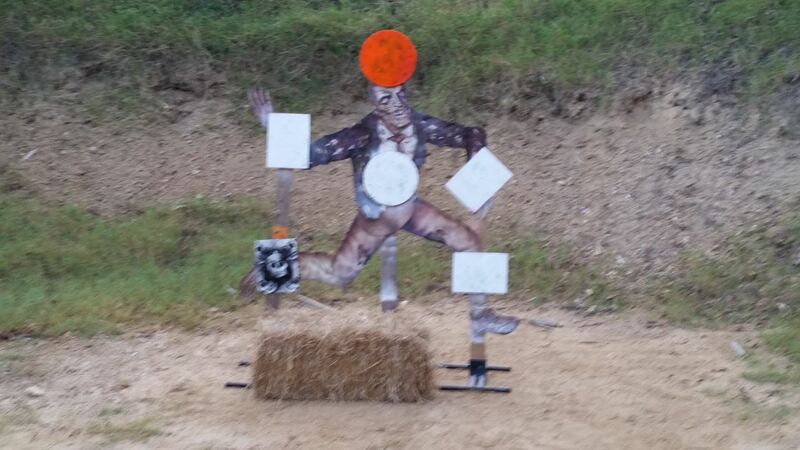 By the time the third squad reached the zombie he was getting quite shot up! 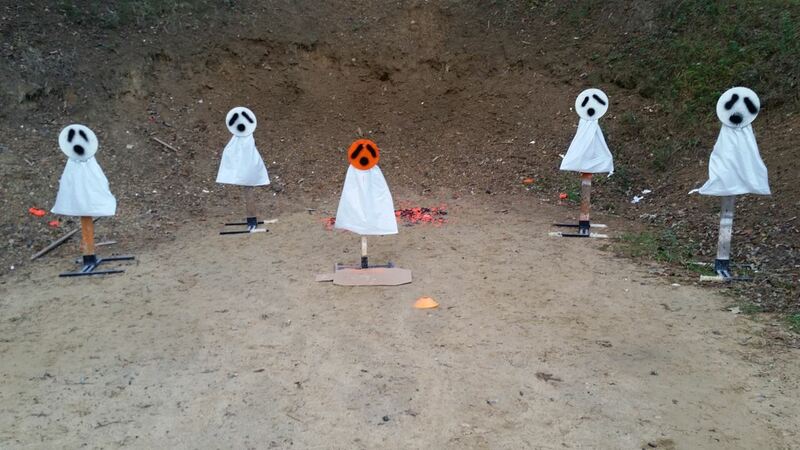 Stage 3 - "Gaggle of Ghosts" - Shoot in order (far left, far right, left, right then stop plate). 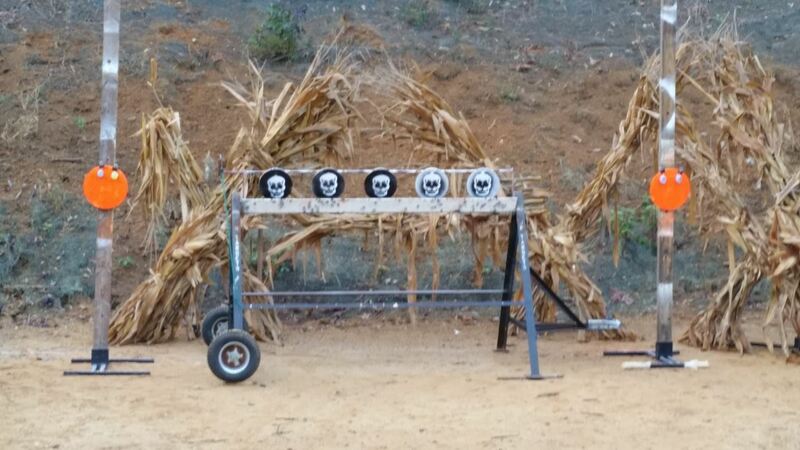 Stage 4 - "Skull Shoot the plates left to right and then the left stop plate for strings 1 and 2. Then shoot right to left and the right stop plate for strings 3 and 4. Then shooters choice on string 5.